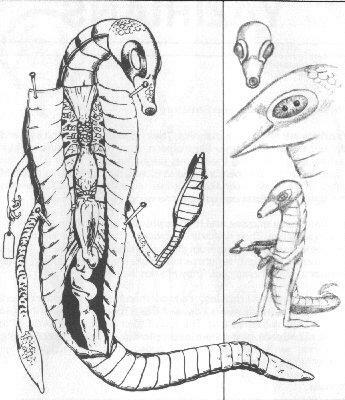 Sather are long, worm-like creatures. Their bodies are divided into segments, like an earthworm's. They do not have a skeleton. Instead, they support their bodies hydrostatically, by pumping liquid into the segments so they become hard. A shiny, clear slime coats their skin. Scientists believe they are warm-blooded, but no live specimen has ever been studied. A Sathar's head tapers toward its mouth, which is circular and ringed with teeth. Each of their two eyes has two pupils. Four tentacles, two on each side of the body, are arranged about 1 meter below the head. The first pair is slender and weak-looking, and about 1 meter long. These end in four smaller finger-like tentacles. The second pair of tentacles is stronger and about 1.2 meters long. Both of these tentacles end in a paddle-like pad. This second pair is used for heavy lifting, while the smaller tentacles are used for fine work and for holding small weapons. A Sathar moves by slithering across the ground with the first meter of its body raised. They also can coil like a snake, raising 1.5 meters of their bodies from the ground. The color of Sathar skin varies from yellow to brown. The tentacles are the same as the body, but with a slight greenish tint. The underbelly is pale pink. A pattern of dots, speckles and stripes decorates the back of the head. These patterns are natural on some Sathar, but are tattoos on others. Some survivors of Sather attacks have reported that Sathars are not effected by electrical shocks or doze grenades, but these reports have never been confirmed. The Sathar's double pupils give it very wide angle vision. They can see objects in front of them and to both sides at the same time. They smell through two pits in front of their eyes. The sharpness of their senses is not known, but Imperial biologists assume their hearing, smell and taste is about the same as a Human's. Captured recordings show that Sathar can speak Basic and other languages. They hiss and lisp when they speak. Their native language has never been translated. Almost nothing is known about Sather society. They have tried to kill every alien creature they have met in the Empire, usually with alarming success. No one knows why the Sather attack so viciously or what they hope to gain. All attempts to contact the Sathar peacefully have failed. No Sathar has ever been captured alive, because they kill themselves before they can be taken. In one case, an entire Sathar ship self-destructed to avoid being captured. Stasis fields have been applied to several dead Sathar in an attempt to have them revived, but biologists have not been able to find a revival technique that works on them. Scientists have proposed several theories, based on reports from observers. The most widely accepted was 'written by Gdtlask Gitak, a Vrusk sociologist. Gitak's theory states that all Sathar belong to military units called cadres. The markings on the back of the Sathar's head identify its cadre. Each cadre trains its members as soldiers from the time they are born. Gitak theorizes that Sather attack alien worlds because their military society would fall apart if there was no enemy to fight. Readers are warned that this is only a theory. Until a Sathar is captured alive, their true motivation will not be known. All Sathar should be considered hostile and dangerous. Citizens of the Empire who encounter Sather are required by law to report the incident immediately. If escaping is impossible, citizens are advised to attack on sight, as friendly approaches have always failed in the past. Sather also are known to use aliens of any race agents to overthrow Imperial, Corporate Sector and local governments, terrorize citizens and disrupt trade. Like the Sathar themselves, these agents are extremely dangerous. Suspicious beings should be reported immediately. Citizens are discouraged from attacking Sathar agents, as most are trained and experienced killers. A Sathar can hypnotize a character by talking to him in a non-combat situation. Sathar's have a starting Perception + 2D hypnosis ability vs. the target character's Perception. If he fails, the target is hypnotized. A hypnotized character will think the Sathar is his friend, and will want to cooperate with it. He will see things the way the Sathar describes them, if his other senses do not contradict what the Sather tells him. (For example, a character would not believe that a fire was a pool of water). A Sather can command a hypnotized person to do something at a specific time, and to forget that he has been hypnotized until that time. For example, a character could be commanded to turn off a security system at midnight.